Many gifted biographers have struggled to bring John Keats alive upon the printed page. This page, however, collects the words of his contemporaries, the people who knew Keats best. Their memories were sometimes faulty or contradictory; they could not even agree on the color of his hair. Yet these recollections provide valuable insight into Keats’s character, – his love of life, his extraordinary talent, his kindness and generosity. Keats’s admiration of Spenser lessened as he matured and developed his own voice. With this opinion, Reynolds was merely repeating the popular misconception that unkind reviews destroyed Keats. 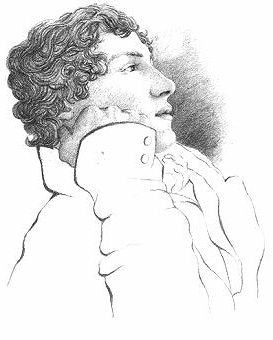 “Whether it was in the latter part of the year 1815 or the early part of the year 1816 that my acquaintance with John Keats commenced I cannot say. We were both students at the united hospitals of St Thomas’s and Guy’s, and we had apartments in a house in St Thomas’s Street, kept by a decent respectable woman of the name of Mitchell I think. [After naming his other fellow students, the witness goes on]–John Keats being alone, and to avoid the expense of having a sitting room to himself, asked to join us, which we readily acceded to. We were therefore constant companions, and the following is what I recollect of his previous history from conversation with him. Of his parentage I know nothing, for upon that subject I never remember his speaking, I think he was an orphan. He had been apprenticed to a Mr Hammond surgeon of Southgate from whence he came on the completion of his time to the hospitals. His passion, if I may so call it, for poetry was soon manifested. He attended lectures and went through the usual routine but he had no desire to excel in that pursuit. . . . He was called by his fellow students ‘little Keats,’ being at his full growth no more than five feet high. . . . In a room, he was always at the window, peering into space, so that the windowseat was spoken of by his comrades as Keats’s place. . . . In the lecture room he seemed to sit apart and to be absorbed in something else, as if the subject suggested thoughts to him which were not practically connected with it. He was often in the subject and out of it, in a dreamy way. He never attached much consequence to his own studies in medicine, and indeed looked upon the medical career as the career by which to live in a workaday world, without being certain that he could keep up the strain of it. He nevertheless had a consciousness of his own powers, and even of his own greatness, though it might never be recognised. . . . Poetry was to his mind the zenith of all his aspirations: the only thing worthy the attention of superior minds: so he thought: all other pursuits were mean and tame. He had no idea of fame or greatness but as it was connected with the pursuits of poetry, or the attainment of poetical excellence. The greatest men in the world were the poets and to rank among them was the chief object of his ambition. It may readily be imagined that this feeling was accompanied with a good deal of pride and conceit, and that amongst mere medical students he would walk and talk as one of the Gods might be supposed to do when mingling with mortals. This pride exposed him, as may be readily imagined, to occasional ridicule, and some mortification. Having a taste and liking for poetry myself, though at that time but little cultivated, he regarded me as something a little superior to the rest, and would gratify himself frequently by shewing me some lines of his writing, or some new idea which he had struck out. We had frequent conversation on the merits of particular poets, but our tastes did not agree. He was a great admirer of Spenser, his Faerie Queene was a great favourite with him. Byron was also in favour, Pope he maintained was no poet, only a versifier. He was fond of imagery, the most trifling similes appeared to please him. Sometimes I ventured to show him some lines which I had written, but I always had the mortification of hearing them condemned, indeed he seemed to think it presumption in me to attempt to tread along the same pathway as himself at however humble a distance. He had two brothers, who visited him frequently, and they worshipped him. They seemed to think their brother John was to be exalted, and to exalt the family name. I remember a student from St Bartholomew’s Hospital who came often to see him, as they had formerly been intimate, but though old friends they did not cordially agree. Newmarsh or Newmarch (I forget which was his name) was a classical scholar, as was Keats, and therefore they scanned freely the respective merits of the Poets of Greece and Rome. Whenever Keats showed Newmarch any of his poetry it was sure to be ridiculed and severely handled. Until the day of resurrection. When Stephens originally recounted this story to Milnes, he omitted the references to women. Contrary to the impression this story gives, Keats did take notes during lectures. He also passed his Apothecary licensing exam on the first try; Stephens did not. This incident occurred while Keats was ill with tuberculosis, thus confirming his robust constitution. Keats’s physical strength and stout figure were the main reasons his friends believed he wasn’t tubercular. I find by the Daily Papers that the young Poet, John Keats is dead. I shall feel gratified if you will allow a few remarks from his School-fellow and Friend a place in your paper. I remember his first introduction to Mr. Hunt, and the pleasure each seemed to derive from the interview. I remember with admiration all that Gentleman’s friendship and disinterestedness towards him–disinterestedness which would surprise those only who do not know him. I remember, too, his first introduction to Mr. Haydon; and when in the course of conversation that great artist asked him, “if he did not love his country,” how the blood rushed to his cheeks and the tears to his eyes, at his energetic reply. His love of freedom was ardent and grand. He once said, that if he should live a few years, he would go over to South America, and write a Poem on Liberty, and now he lies in the land where liberty once flourished, and where it is regenerating. I hope his friends and admirers (for he had both, and warm ones) will raise a monument to his memory on the classical spot where he died; and that Canova, the Roman, will contribute that respect so amply in his power to the memory of the young Englishman, who possessed a kindred mind with, and who restamped the loveliest of all the stories of his great countryman Boccaccio. And renowned by thy Grave. Some critics / biographers believe the anonymous “Y” was Charles Cowden Clarke.